With Christmas fast approaching it’s time to finish up the gift shopping (if you’re like my uber-organized mom), or get started on the list (if you’re like me). I love to give handmade gifts for Christmas. Unfortunately, a lot of hand made gift ideas are either for children or are, quite frankly, pretty cheesy. So if you are looking for an idea for adult gift giving that’s not cheesy, I just may have the perfect thing. It’s fast, it’s easy, and it’s customizable. It’s also inexpensive. Are you ready? It’s………Bath Salts! Ta da! What? No? Why? Ok, I know, I know, not everyone has time for a long, hot, soak. Especially at this time of year. I understand that completely. But did you know that you can use bath salts in the shower? Really. You can. Really. Just throw a handful in the back of the shower where it well get wet but not immediately washed away. That way you still get the wonderful soothing (or invigorating, whichever you choose) scent in your shower when you don’t have time for a bath. Of course, you won’t get the other benefits that you would if you were soaking. And what are the benefits of soaking? I’m so glad you asked! 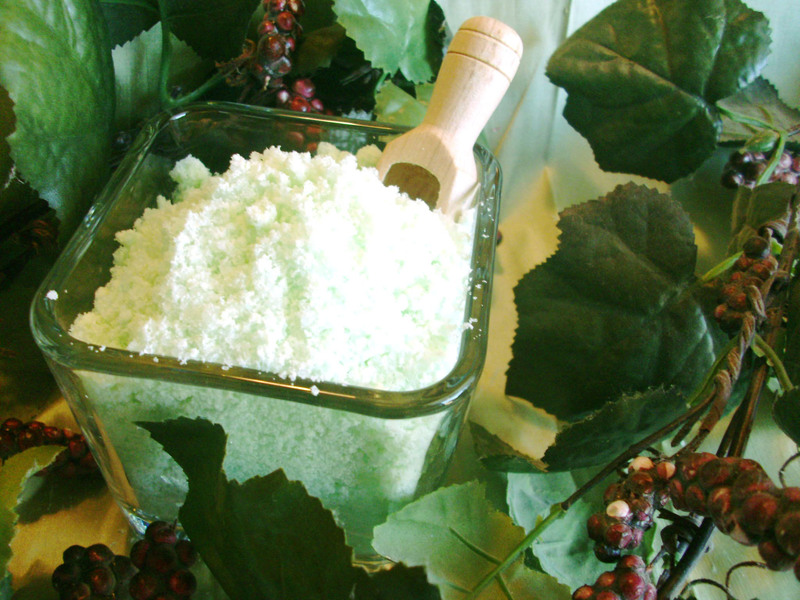 Other than getting away from the kids for a while, there are some very practical benefits of taking a bath with bath salts. 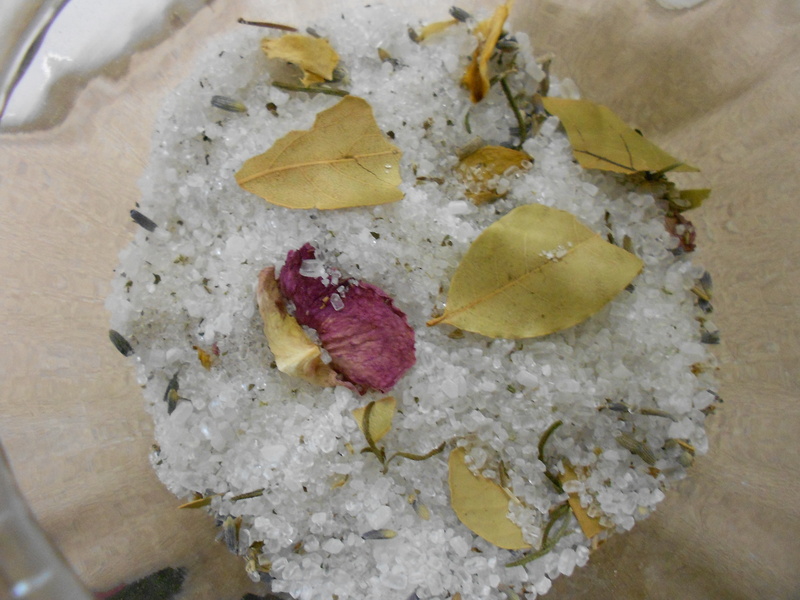 Epsom salts help to soothe tired, sore muscles and also helps to heal bruises. 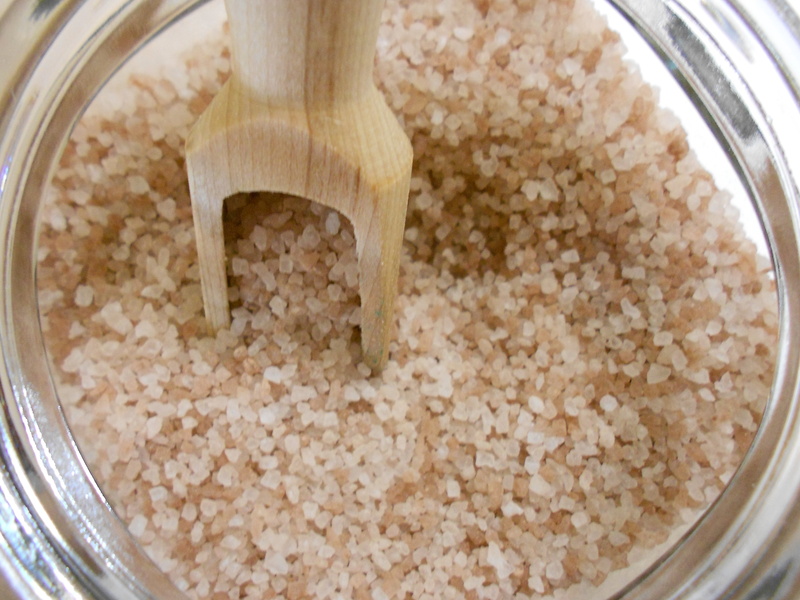 Sea salt helps to remove impurities from your skin. 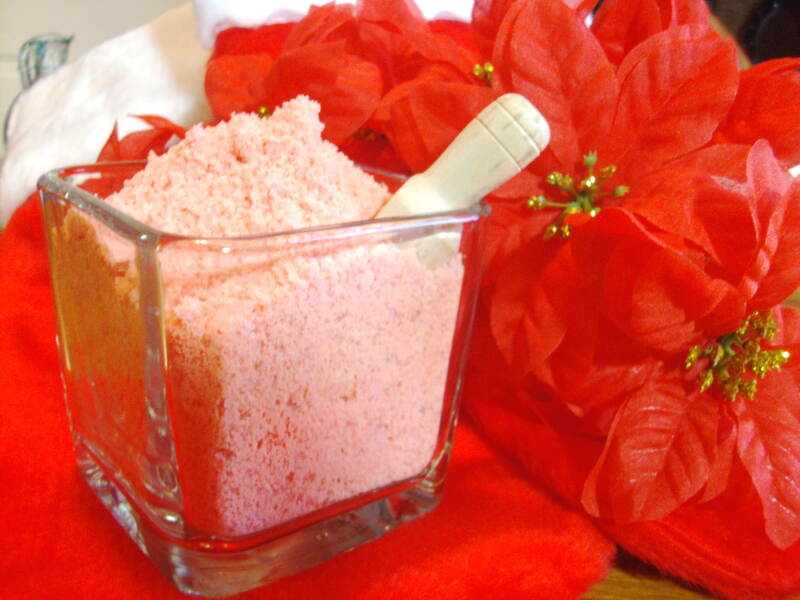 And if you choose to use essential oils rather than fragrance oils for your bath salts, you get aromatherapy benefits as well. You should be able to find all the ingredients readily. I found the Epsom salts in the pharmacy area of my local big box store. The sea salts, fragrances, and colors I found at my local craft store. You can mix up one big batch for everyone on your list, or you can mix everything except the color and fragrance and separate it into smaller batches for a more personalized approach. Then, just pack it into a pretty jar or a waterproof bag and you have lovely, handmade gifts for Christmas. Here are some pictures to help spark your creativity. Below that is the basic bath salts recipe that I use. I found it online at About.com. This one is scented with a mixture of thyme and rose. My favorite one. This is actually more red than it looks in this picture. This was divided and part was colored darker than the rest. This is a batch my sister made. She added organically grown flowers and herbs. Mix the salts and the baking soda well, making sure there are no clumps. Add the fragrance or essential oil and mix well. If you are going to color it, add the color a few drops at a time. Too much will make the salts clump. 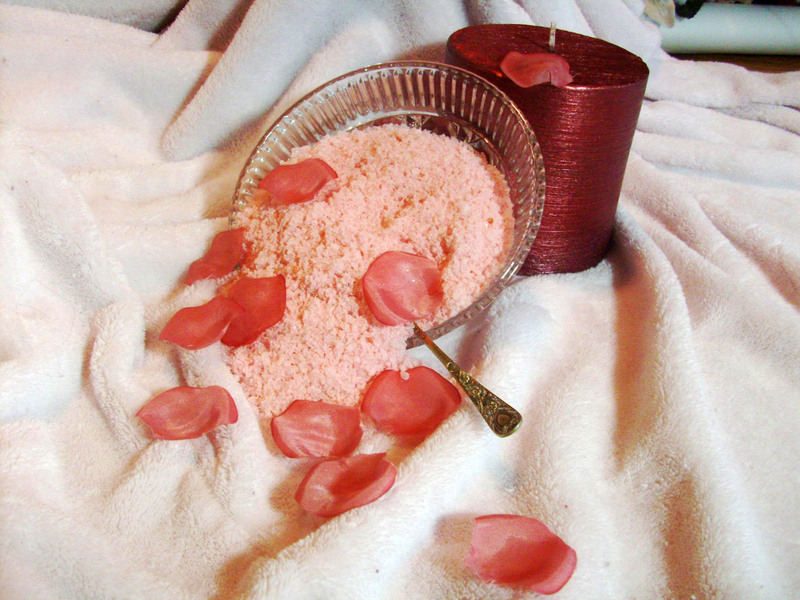 You can color all the salt or just some of it, or even use different colors and mix or swirl it together. Be creative! Have fun! Then come back and share your results with the rest of us.